Tucked away in the folds of the western coastline of New Zealand’s South Island lie the 14 sounds of Fiordland National Park. While each inlet, a large firth of calm water captured between high cliffs, is beautiful in its own way, the showstopper is undoubtedly Milford Sound. After all, who couldn't fail to be moved by this vast, water-filled chasm, its towering grey rocks peppered with waterfalls, its glass-like waters home to rare Fiordland crested penguins and New Zealand fur seals, and the forested summit of Mitre Peak towering 1,690 metres above it all. According to the Oxford English Dictionary, a sound is defined as a body of seawater mostly surrounded by land. A fiord (sometimes fjord) is a long, narrow, deep inlet of sea between high cliffs, typically formed by submergence of a glaciated valley. It’s a subtle difference, but as Fiordland’s ‘sounds’ were actually created by glaciers, they are all technically fiords, despite the misleading names. Other than Milford and Doubtful Sounds, the fiords of Fiordland are accessible only by sea or air, so unless you’ve got the time and money for a multiday cruise, these two are you best bets. 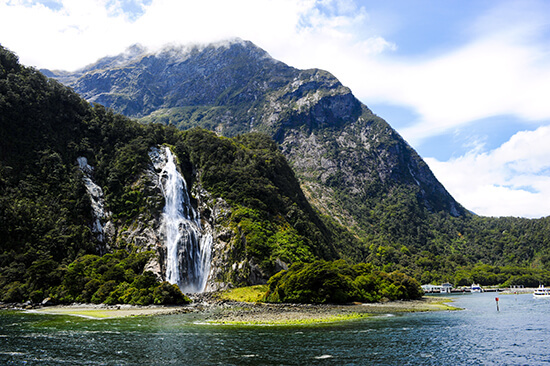 Being on the front cover of just about every guidebook going, most visitors make a beeline for Milford Sound, meaning that if you choose harder-to-reach Doubtful Sound you’ll have the place practically to yourself. For me, Doubtful pipped Milford to the post: the cliffs seemed slightly higher, the fiord was larger, the scenery more dramatic. But perhaps it was the return to the shore that clinched it – we were accompanied by a pod of bottlenose dolphins enthusiastically back-flipping and leaping in our wake. You visit either sound on a day trip by road from Te Anau and Queenstown, or at a push from Wanaka, but it’s a very long way (over 200 miles) so you’d be better off flying. If you’re visiting Milford Sound and you’ve got the time, you can stay in Milford Sound town, which allows you to take the less busy early morning or late afternoon cruises when the light is better for photographs. Plus, the fabulously scenic drive to the tiny settlement is almost as good as the sound itself. Doubtful Sound can be accessed from lakeside Manapouri, but as it’s only a 20-minute drive from Te Anau, which has far more choice of accommodation and facilities, you’re better off staying there. 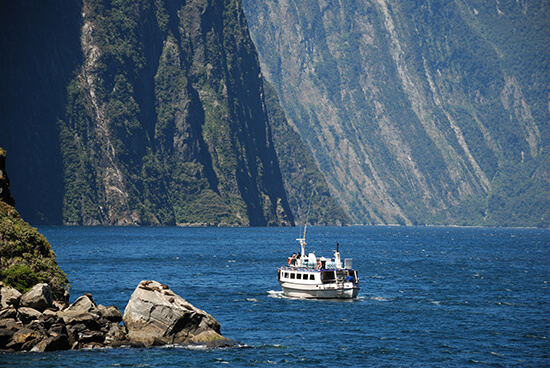 Cruising is the most obvious and most popular way to see the sights of Fiordland. Choose from short and sweet tours of the highlights, wildlife-focused cruises and longer, overnight voyages with kayaking stops included. Some Milford Sound cruises stop at the Milford Deep Underwater Observatory, only accessible by boat, a specially-constructed viewing area 10 metres under the surface. There’s no need to get wet – this is an air-conditioned, glass-panelled room with close-up views of black coral, starfish and perhaps even a passing scuba diver. 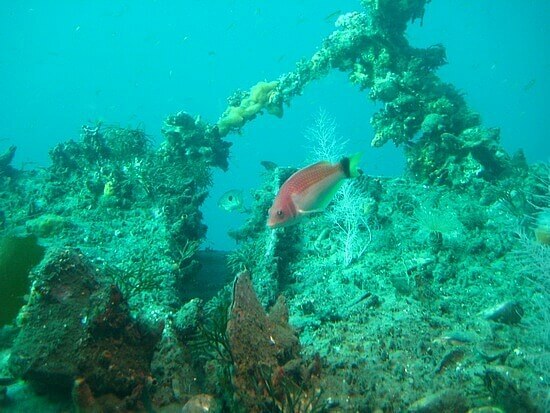 Speaking of which, it might not spring to mind as the number one way to see the sounds, but scuba diving is becoming more and more popular. The submerged cliffs create fabulous wall diving opportunities and are laced with black coral trees. Plus, you might be lucky enough to see dolphins, seals, sharks, eels, octopus, stingray, nudibranchs and over 150 fish species. Just brace yourself for the cold. For a more gentle approach to fiord exploration, grab your paddle and head out onto the water. Wrap up warm and be prepared to get wet as you get closer to the wildlife and waterfalls, discovering the nooks and crannies that are unreachable by boat. Trips usually last a day with lunch, eaten afloat in the middle of the sound, but if you haven’t got a full day to spare, some longer cruises offer kayaking stops too. 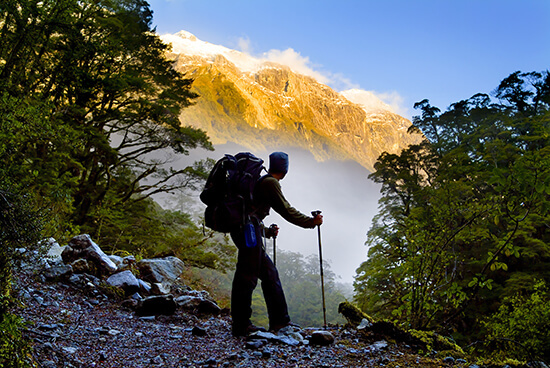 For a different perspective on Milford Sound, hike the 33-mile Milford Track, an ancient Maori path from Glade Wharf at Lake Te Anau to Sandfly Point at Milford Sound. This four-day walk is not to be rushed: take in views of Arthur River, Mackinnon Pass, Bell Rock, various lakes and waterfalls and vast meadows of colourful mountain flowers. 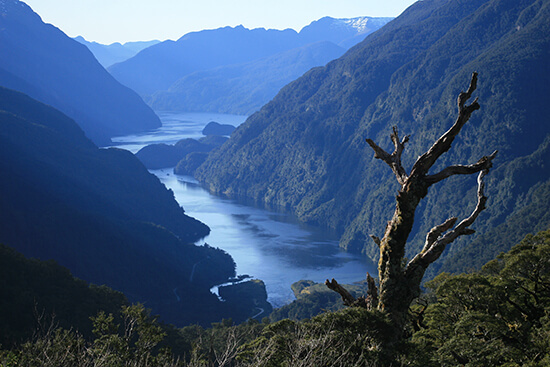 Doubtful has a handful of walks of its own, such as the Old Doubtful Sound Track, a three-hour return hike. If you've got the budget, what could be better than soaking up the scenery of the sounds from the air? From above, you’ll get a sense of the true size of the inlets, as well as a panoramic view over Fiordland National Park. 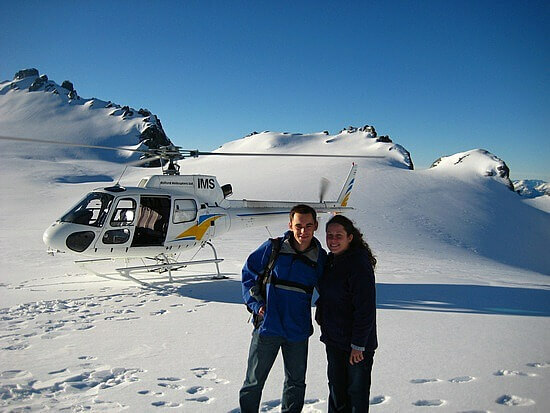 Choose to fly over just Milford Sound or both Milford and Doubtful Sounds or, as I did, take a helicopter over Milford Sound then land on the ice of the Mt Tutoko Glacier. Flights can also be combined with cruises for an action-packed day. 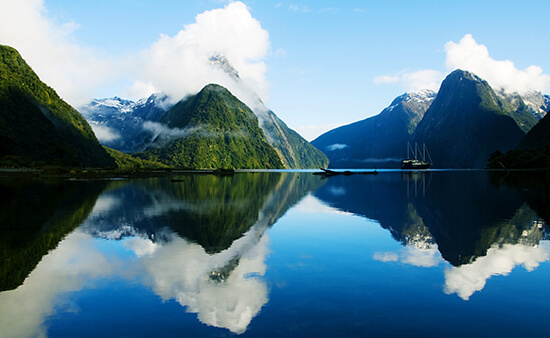 Cruise the calm waters of Milford Sound with Flight Centre’s Best of the South Island Journey, which includes a day trip to Milford Sound from Te Anau with a lunchtime cruise.